A salt and pepper beard. You will remember last year when we first saw the salt and pepper beard. It was a revelation. Many babies were conceived that day. But I had no idea that the beard was for this movie. Based on the beard I decided then and there that the rating would hover around 860 million stars out of ten. The beard did some incredible acting. Dwayne The Rock Johnson’s beard spoke to me. I cannot actually remember what else happened in the movie after the first 10 minutes due to Dwayne The Rock Johnson’s beard. But I know that I felt secure and safe in my rating of this movie as potentially 2018’s film of the year. But then an awful thing happened. 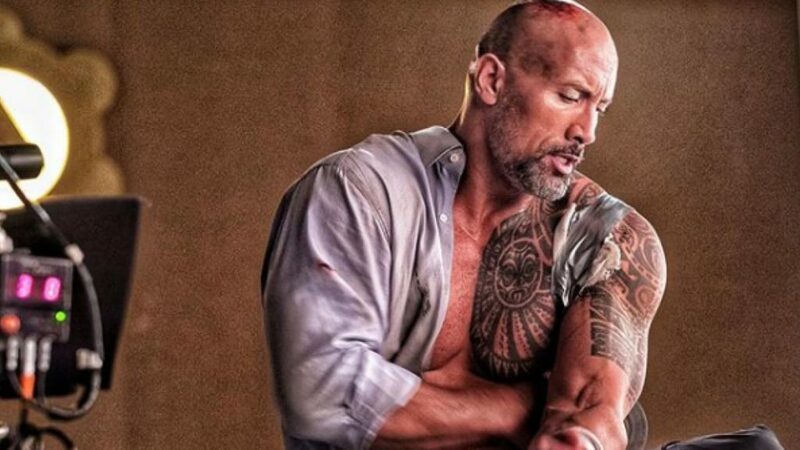 Dwayne The Rock Johnson got some kind of glass shard stuck into his huge, perfect chest. This in itself was good news – my friend and I looked at each other knowing what was coming next. It was us. He was going to take his shirt off. The shirt had been barely hanging on. It had burn holes in it, blood, it was sooty, it was tight in that way that Dwayne The Rock Johnson’s perfectly tailored shirts are tight. We took a deep breath, we readied our bodies. And then he took his shirt off. The collective gasp from the women in the cinema was audible. You’ve seen Dwayne The Rock Johnson with his shirt off many times but it never stops being powerful. It never stops being a moment of deep humanity and compassion toward us – the Dwayne The Rock loving world. In these times of despair we look to Dwayne The Rock Johnson’s chest and we are reminded that this world can still beautiful. There is still so much to see in this world – there are still sights, like Dwayne The Rock Johnson’s chest, that take our breath away. It is similar to when you first look at your newborn baby, or you walk up the aisle and see your lover’s face, or when you see a wonder of the world – but it’s infinitely better. And then, the horror – he put his shirt back on. It felt like whiplash from a brutal car accident. My friend and I looked at each other appalled. Why on earth would he put his shirt back on when it was fucked anyway and he knows what we need. It is like laying out a banquet, letting someone have one bite, and then throwing it all in the bin. Such was my outrage I can’t remember the rest of the film. I struggled all night to work out how I would reconcile the offensiveness of Dwayne The Rock Johnson putting his shirt back on when he didn’t need to. There were so many unanswered questions – Why didn’t he rip the sleeves off to potentially zipline from the skyscraper? Why didn’t he just leave it unbuttoned? Why didn’t he search the skyscraper for another shirt and then spend the majority of the film trying on comically small shirts that he busts out of while making deep eye contact with the camera? Then as I was tossing and turning, a million questions plaguing me, my three-year-old vomited almost directly into my mouth as he was insisting on sleeping on me rather than next to me. I jumped up and tried to wipe my face while he violently chundered exorcist style all over the bed. My husband jumped up and grabbed a towel and tried to catch the vomit that was now on my chest and in my hair and pooling in my crotch as I held the baby aloft trying to get the vomit to land in the towel. The vomit landed everywhere but the towel. The baby fell asleep again as we changed the sheets. Heart racing I laid still and looked at my sleeping baby. Then vomited everywhere again. He continued to vomit for an hour. We used every towel in the house and changed the sheets three times until eventually we were forced to just lay in the wiped up vomit. As I turned the pillow over to the dry side I thought of Dwayne The Rock Johnson. I thought of him picking me up and carrying me gently to my bed. I thought of him swaddling me like an adult baby and kissing my forehead. I thought of him turning off the light and saying “go to sleep for a few days my love”. And I thought about sleeping for 48 hours as he washed all of the linen and remade all of the beds and sorted the laundry cupboard into properly folded sheets and duvets and pillow cases so if you need to get up at 4am and try to remake the bed for the third time because your child has the devil inside of them you can immediately find what you need. I thought about sleep and Dwayne The Rock Johnson washing, folding, and organising my laundry cupboard. And I realised that Skyscraper needs to be given 900 million stars out of 10.